Updated 7/23/18. As social media has become so central to the lives of many park guests Disney has worked hard to appeal to those Instagram loving fans. Instagram has been on the rise as one of the most popular social media apps for some time now and it makes sense for Disneyland to join in on the fun. 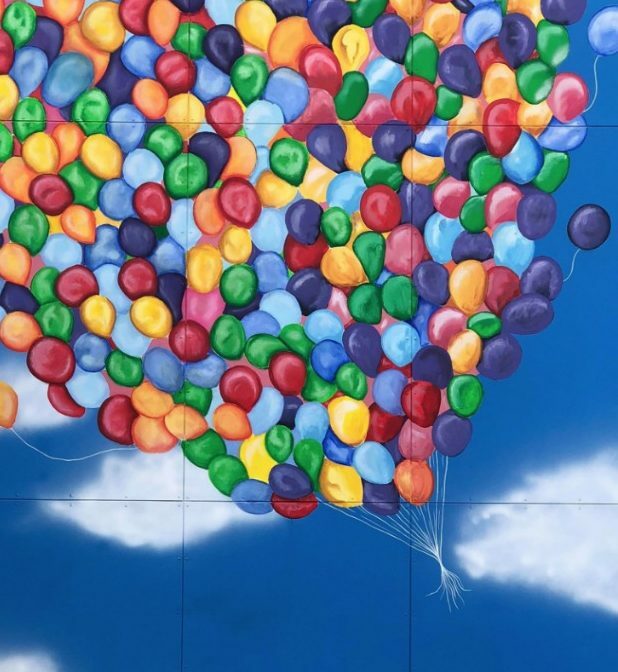 The popularity of Disneyland Instagram walls has taken social media by storm. The new Pixar Pier is a great example of that with Disney themselves promoting all the “Instagram-Worthy” photo spots available at this new pier. You can even see this change reflected in the food for Pixar Fest with bright colored drinks and aesthetically pleasing appetizers at the Lamplight Lounge that are all perfectly constructed with that Instagram post in mind. So where can we find all these new Instragammable walls in the parks? What does it mean that Disneyland is now one of the most Instagrammable places in the world? And how does the popularity of Instagram change the experience of the Disney parks? We explored this new trend taking the parks (and social media) by storm. 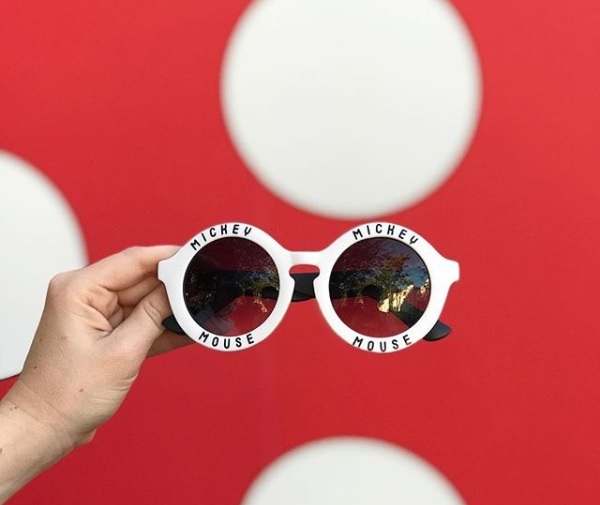 Before we dig into the meaning of this cultural trend, let’s take a trip of sorts around Disneyland to find all these Instagram worthy photo spots. The most famous Instagram wall can be found near the it’s a small world ride. Be prepared- this wall has it’s own informal queue! Celebrate Minnie’s legendary polka dots in front of this ToonTown themed wall near Minnie’s House. Nothing like a sunset backdrop to tell your followers you’re in California Adventure. You can find this wall in the Hollywood Studios backlot area across from the Marvel meet and greet. Best time to take photos here? You guessed it, sunset! The shadows cast on the wall is one of the key features of this Instagram spot. One of the first walls to start the trend, you can find this famous shade of blue in Hollywood Land Backlot under Stage 12. We don’t know a lot about sports, but we know something big happened with the Dodgers recently! Go Dodgers! We love the color blue, so, it works. Celebrate your sense of adventure in front of this wall found on the path from Frontierland to Fantasyland. In a galaxy not so far away, strike your favorite Star Wars pose in front of this wall in Star Wars Launch Bay. This wall was made Instagram famous by fan engagement photos! You can find this wall in the Animation Building in California Adventure. 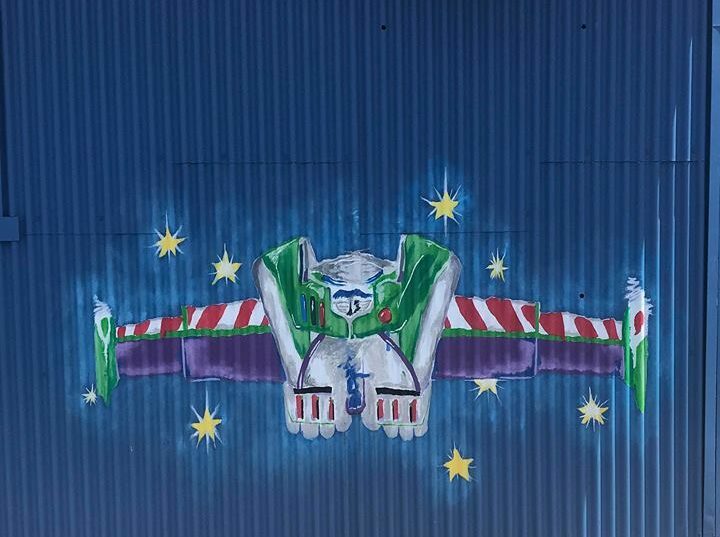 You can fly to infinity and beyond at this wall located in the far corner of Hollywood Studios near the Monsters, Inc. Mike & Sulley to the Rescue! attraction. Celebrate family by taking that perfect family picture in front of the Coco Wall located at Pixar Pier. Such a beautiful picture by @melooww Que Bonita!? This was voted one of the most new popular walls by Disney Style fans. Find this tasty wall at Pixar Pier. Adventure is out there… or at least the perfect Instagram photo is. Maybe this will stop folks from asking the balloon people if they can hold the balloons for a picture? Find this wall next to the Buzz Lightyear wall near Stage 12. Pose with your BFF in front of this wall celebrating all things friendship at Pixar Pier. In 2017, Disneyland earned the honor of being named the #1 Instagrammed location around the globe. It turns out that the most magical place on Earth is also the most popular place to take Instagram shots. It’s not too surprising that with the age of smartphones and social media at our fingertips that we’re seeing such a large influence play out in the Disney parks. But it’s moved beyond just family pictures being posted on Instagram. (But those are pretty popular too!) The new trend of Instagram walls rose in popularity as Instagram savvy guests began discovering once ordinary walls of the park would make the picture-perfect back drop. The two most famous of those that began the trend being the it’s a small world wall and the blue sky wall in Hollywood Studios. If you search their respective hashtags, you will find thousands of photos from Instagram aficionados in a variety of poses in front of these walls. 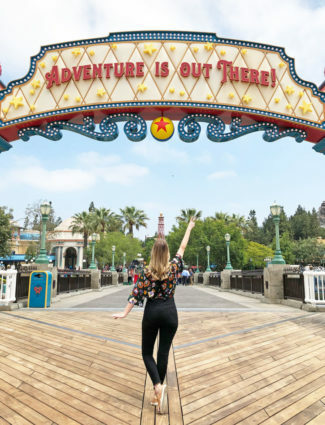 The popularity of this trend has Disney park tip bloggers scrambling to write up guides detailing all of the Disneyland Instagram walls that can be found. Now when guests are making their research lists, right below ‘where to eat’ may sit ‘list of Instagram walls.’ This popular Instagram trend isn’t just reserved for teens, although they make up a large portion, but for Disney fans of all ages searching for that perfect Instagram picture. When looking through the hashtags on Instagram in our shared images above, you will see a large age range of Instagram fans posing in front of these beautifully designed walls. For those that don’t subscribe to this new trend of posing in front of colorful walls, visitors can at least admire the artistic flair that Disney has put into the new Pixar Pier walls. The beauty of these walls cannot be denied and the ambiance it adds to the pier was a nice move in Disney’s redesigning plans. Just try not to stumble over the Instagramers with their feet in the air (to get that perfect sneaker pic!) as you stroll around the pier. Many guests remember coming to Disneyland before the days of smartphones and technology at our finger tips. The experience of picture taking was a much different one in the days of Kodak and disposable cameras. There was no instant pay off of seeing your photos right away. You had to wait until you got home before seeing the final results. Photos did not have the same public exposure that they do now. Memories were built primarily on the experience rather than a process of documenting it. Now that’s not to say technology erases our experience. But it definitely has become a central part of our experiences. Who doesn’t want to immediately share their picture in front of Sleeping Beauty’s castle on Instagram or other social media sites? Disneyland is an experience valued and appreciated by many. And for guests that can only afford to make the trip occasionally, it’s definitely one they want to share. One could argue that the era of smartphones and Instagram has made our attention to detail greater. I would likely never have noticed the beauty of the wall by the it’s a small world attraction if it weren’t for the popularity of these Instagram posts. As a bit of a phone addict myself, I do find myself slowing down when I take pictures to notice the small details in the parks. My pictures of the parks are also what helps me count down the days between visits. If I’m feeling down, I can turn to our extensive (and I mean extensive!) photo album of my most recent visit and it helps lift my mood. But in some cases, if we find ourselves experiencing the world behind our camera lens- how does that change our memories? Watching the Disneyland fireworks through the camera phone makes for a different and distance experience. Many argue that this rise in social media has changed our experiences for the worst. If we spend the attraction videotaping the ride, are we really getting the most out of the experience? I am sure that’s not how Walt envisioned his guests experiencing his beloved attractions. If our entire interaction with Mickey Mouse takes place behind the camera lens, will we remember the details? Like with everything in life, there must be balance. Disneyland is known for being innovators in many ways and one of those is pioneering the trend of the experience economy. The idea behind the experience economy is that a business sells the experience and not necessarily just a service. Disneyland is all about experience whether it’s immersing yourself in the fairy tale of Fantasyland or falling into the future of Tomorrowland. There’s a reason Disney refers to people that come to the parks as guests and not customers. Capturing Disneyland park moments on Instagram is a move towards collecting experience. Your Instagram is a reflection of the your life experiences and most Instagramers want to add Disneyland to that list. Documenting your trip in front of these iconic walls is one colorful way to add to that collection of experiences. 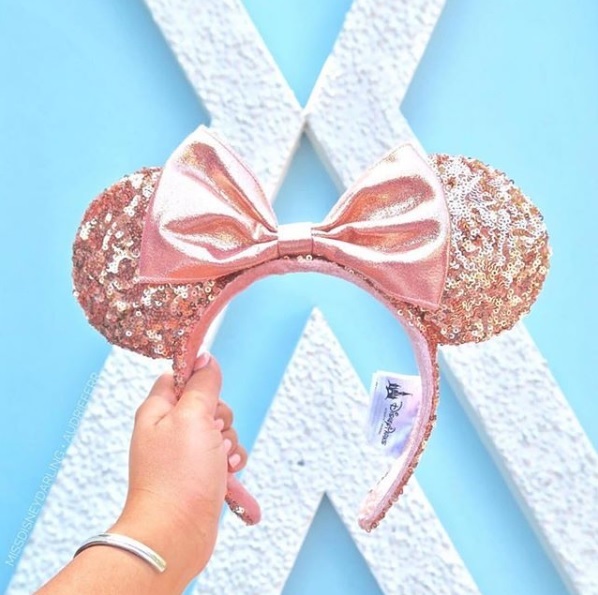 And if you can get your hands on those iconic rose gold Minnie ears to fit that perfect color scheme, why not? Glad that you enjoyed it Jonni. There is no D23 Expo this year as they are held every other year. I will absolutely be back again next year for the fantastic event!